Eddie Santos has over 20 years of soccer experience which he acquired having played and coached at various levels. Growing up in South Florida, he played Varsity, Club and Semi-Pro Soccer. 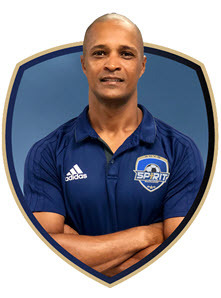 Bringing his extensive experience to Central Florida, he has successfully run and operated Futbol Club Elite (formerly Empire Soccer Academy) for almost 10 years. 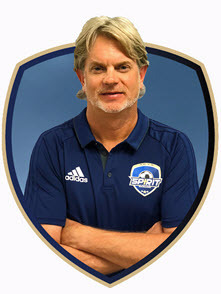 Eddie's vision for Spirit United is not only to teach the players the fundamentals along with advanced technical and tactical soccer skills but also to help them grow as individuals. His focus is on helping the players understand the game of soccer while inspiring and supporting their own individual growth and development of character and faith. His goal is to instill these core values so they may grow as individuals withd deep respect for family, friends, teammates, as well as, fellow competitors. Claude Davis was born and raised in Kingston, Jamaica. He fell in love with the game at the age of 8. Coming up through the ranks playing in high school soccer leagues he was selected for the Jamaican National program and was a key figure for the under 20’s and under 23’s. As a result of hard work, he was drafted to play on the senior national team at the age of 22 while serving as captain for his club team Portmore United. Davis has made 68 international appearances for Jamaica, scoring goals and captained the team on several occasions. At the age of 24, he signed a professional contract to play in England and over the course of 13 years he had the opportunity to play for various clubs in the English Premier League as well as Championship and League 1. Over the course of his career he was blessed to have played against and alongside some of the best players in the world to have ever played the game including Ronaldo and Ronaldinho (Brazil), Cristiano Ronaldo (Portugal), Thierry Henry (France), David Beckham, Steven Gerrard, Frank Lampard, Rooney (England), Clint Dempsey and Landon Donovan (USA) just to name a few. One of his most memorable history making moments was beating Arsenal United while playing for Sheffield United. It was SUFC's first time in history beating Arsenal in a Premier League match. Automatic Promotion with Crawley Town FC and Rotherham United, from league 2 to league 1 to the Championship respectively. During, the summers he would return home to Jamaica and assist in coaching his former club, but it was while at Crawley Town FC that he had the chance to be an ambassador for the Junior Reds Program and work with children. Along with playing and coaching, Claude has served as an analyst for Jamaican station CVM during the World Cup 2010 as well as World Cup 2014. Gustavo Caraballo was born in Caracas, Venezuela on June 21, 1972, Gustavo has a long and very accomplished resume that began in 1989 where he debuted as a Professional Player in Caracas for Club Sport Maritimo. During his time there, he played at a number of Elite Clubs and was instrumental in securing a National Championship Title for his team in 1990, 1992 and 1994 with Club Sport Maritimo, and in 1999 with team Deportivo Itaichacao in Caracas. His Venezuelan National career participation began as a U20 player in 1990 playing in the South American Youth Tournament, 1990 at the Central American and Caribbean Games in Mexico with the U23s, and in 1994 at America's Cup in Colombia against National Groups from Uruguay, Argentina, and Costa Rica. Internationally, his player resume includes having participated in the Toyota Libertadores Cup for Sport Maritimo in 1990, 1992, 1994 and 1995, in the Commebol Cup in 1993 with Club Maritimo, 1997 with Estudiantes of Merida, 1999 with Deportivo Itaichacao and 2001 with Trujillanos Futbol Club from Caracas. His final International appearance as a player was in 2003 at the Nissan South American Cup with Deportivo Italchacao. Gustavo has worked closely with esteemed Technical Coaches Raul Cavalieri and Carlos Maldonado. His impressive coaching experience includes positions as the Assistant Technical Coach for a number of elite teams in South America some of which ended their seasons with National Championships. These positions were held at the following Clubs: 2004 Deportivo Italchacao; 2004-2006 Union Athletico Maracaibo achieving the Championship of the opening and closing Tournaments, National Champions 2004-2005 and opening Tournament Champions 2006; 2007-2010 with Athletico Maracaibo achieving the Championship of the opening and closing Tournaments, National Champions 2004-2005 and opening Tournament Champions 2006; 2007-2010 with Deportivo Tachira winning the closing tournament and National Championship in 2007-2008 and the opening Tournament Championship 2009-2010; 2010-2012 with ACC Mineros of Guayana winning the 2011 Venezuelan Cup and participation in the South American Cup against Columbia and Paraguay. His most recent position in 2013 was as Assistant Technical Coach with Aragua F.C. Gustavo currently holds a Pro A License and a Venezuelan National License. His coaching education includes an internship in San Lorenzo of Almagro in Argentina with Technical Coach Ramon Diaz. In June of 2007, he was given the distinct honor of being credited as a Technical Director of Professional Soccer in the X111 National Coaching Course category dictated by the Venezuelan Soccer Federation and the National Association of Coaches. ACYS Spirit United is honored and very excited to welcome Gustavo to our Club. 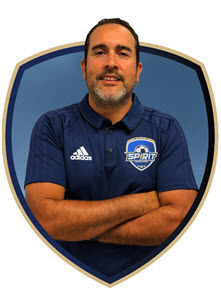 Gustavo has the background and knowledge to help drive the Spirit United Program further along its path of achieving its goal of being able to offer the best development option for Youth Soccer Players in Central Florida. 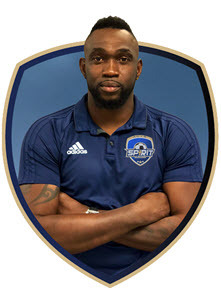 In his role as Technical Director, he will be instrumental in developing a program of consistent and result driven technical and tactical training, strength training, and speed and agility training across all ages and genders within the Spirit United Program. He aims to develop long-term plans to help create pathways for both the Players who are striving to play at the highest levels and the Spirit United Coaches willing to learn his methods. In his short time with the club, he has already been able to scout and place a very talented Central Florida U15 player Luis Mora in the U15 player pool for the Venezuelan National Team. Venezuelan-born, Cesar Baena joins our competitive staff working and training the Spirit United Goalkeepers. In Cesar, the youth keepers of ACYS Spirit United are provided an opportunity to work and learn from someone of the highest caliber goalkeeping and goalkeeper coaching. This level of goalkeeping instruction and expertise is a very rare offering from a Central Florida Youth Club. As a player, Cesar has had an expansive 20-year career playing professionally at the highest levels starting in 1981. This player experience includes playing for a number of teams in Venezuela and Bolivia such as Caracas FC, Estudiantes de Merida FC, Merida FC and Club Deportivo Oriente Petrolero. His experience also includes a number of years playing for the Venezuelan National Team from 1981-1997. Zachary Amatucci is a local boy who grew up playing soccer in Central Florida. Coach Amatucci would descrive himself as a defender and played competitive club soccer at the Rush. While attending Apopka, he was a varsity started beginning in 9th grade thru 12th and was made Captain of his High School team in his senior year. His coaching experience began in a volunteering capacity and he currently works with the Spirit United U10 elite team where he lead the boys to finish in their first two tournaments as Champios and Finalists. Zac is also a certified referee and has experience reffing local Region 3 and ECNL games. Coach Oliver Galleguillos. Oliver was born in Caracas Venezuela where he started playing soccer at the age of 4. His hard work and love of the game created a path for him to play in the amateur league in Venezuela and also for the Miranda State Team. The highlight of his career was being afforded the opportunity to play on the World Cup team for Brazil and also for Cuba. 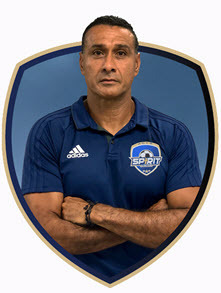 His coaching experience includes 16 years working with the youth programs for Club Hebraica in Caracas Venezuela and also working or the Miranda State Team in the National league where he traveled extensively with his teams to a number of tournaments through out South America and Europe. Oliver has a Bachelor of Science degree and a Venezuelan Soccer Federation A license and a USSF F license. Oliver continues to play for fun in the Central Florida Soccer League. Barry Hyde brings 40 years of playing experience to ACYS Sprit United. He still actively plays in the Central Florida Soccer League. His youth playing experience started in the Washington DC Beltway league in 1974. He played on U13-U17 competitive teams at Annandale and Alexandria Soccer Clubs in 1977-1981 and was a member of the U16 Virginia State Championship team in 1980. He also played in the U16 and U17 Eastern Regional Tournament in 1980 and 1981. In college, Barry was a team member for Rensselaer Polytechnic Institute (RPI) Soccer Team 1983-1988. He was the RPI Varsity Captain in 1987 when they achieved NCAA Division III Top 20 status. Barry's coaching experience began when he was named the RPI JV Coach in the fall of 1988. He has 8 years youth coaching experience U5–U16 with recreational, competitive and premier soccer teams in the Central Florida area. These clubs included Seminole Youth Soccer and Maitland Soccer Clubs. William (Billy) Mathews is no stranger to the local Florida soccer scene. 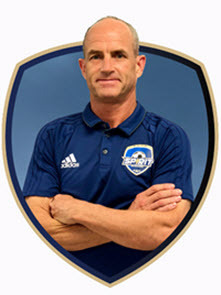 Having played for Downtown Orlando Soccer Club in his youth, from 1981-1988 he was an ODP 1st round player from 1985-1988 and won an AAU National Championship in 1986. Billy was a 3-year Varsity starter at Edgewater High School from 1985-1987. He made the All-Conference 1st team from 1986 and 1987 and the All-Conference 1st team and district 1st team in 1987. His collegiate soccer experience consists of being a 2-year starter at Anderson College Juco where he was an All-Conference player from 1987-1988. His coaching career started at ACYS in the in-house program and he began coaching for Spirit United in 2009. He currently is the Head Coach of the U15 Spirit United Girls and is the Assistant Coach of the Varsity girls at Edgewater High School. 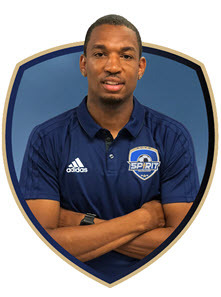 In the spirit of ACYS's continued commitment to the development of all players and staff, the Spirit United Program is excited to have Jai Nascimento as part of our growing team. Playing since the age of 4, Jai moved to Orlando from Rhode Island at 14. His outstanding abilities on the pitch were put on display during his time at Edgewater High School where he was crowned as the leading scorer from his sophomore year until his graduation. Also, during this time, he made the 94 ODP Regional team and was given the opportunity to travel and play against a number of professional teams in Mexico. His college career includes 3 years at Division 1 Coastal Carolina University. Jai is currently working towards getting his coaching licenses and under the direction of Eddie Santos and Gustavo Caraballo will be focusing on the development of some of the future young soccer stars within the Spirit United Program. Peres Nascimento is a native of the Cape Verde Island. He has over 35 years of playing experience. Peres started playing the game of soccer at the age of 5 and quickly developed a passion for the game. He played 4 years in high school and also for many organized clubs in Rhode Island. During his senior year in High School, he was awarded Student Athlete of the Year, MVP for the State All-Star Game and First Team All-State. Peres developed himself to play at a semi-pro level in Rhode Island. He still enjoys playing the game and is currently playing for the Central Florida Men’s league. Carlos Perez was born and raised in Caracas, Venezuela where he played on the U20 National team and as a Professional Player for Caracas FC. In addition, while in Venezuela, he was an integral part of leading his teams to a District Capital National Youth Games gold medal in 1989 and a University National Games gold medal in 1994. His experience as a youth trainer began in 1992 at the Colegio La Salle and the Colegio Tirso de Molina. He currently Coaches at Greater Osceola United. 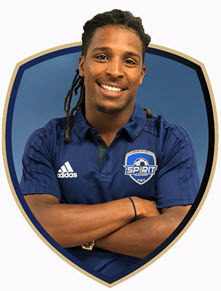 ACYS Soccer welcomes Coach Perez and is happy to have him lend his youth soccer development expertise to the competitive youth players at Spirit United. Collins Smith Jr., or CJ for short, played at the semi-pro level in Bermuda and has extensive youth coaching experience at the Bermuda Athletic Association (BAA) in Hamilton, Bermuda. Currently holding a UEFA C license and having been trained extensively by staff from Barcelona Soccer Academy in Spain, CJ's experience has been working mainly with assisting elite youth players in their development for progression into overseas academies or alternate elite clubs using the Barcelona Methodology technique.